SKU: 69055824160. Categories: All Refill Brush Heads and Accessories, Oral B Replacement Brush Heads. Designed for those who want to floss with their electric toothbrush, this flossing brush head attachment is perfect for getting in between teeth and providing a complete clean. Enjoyed by many, this brushhead can be used to floss away food between teeth. 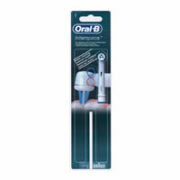 Fits all Oral-B Power Toothbrushes (Rechargeable/Battery) except CrossAction Power.